Tankless water heaters are one of the must-have appliances in any modern home. You cannot afford to miss this accessory in the home especially if you leave in areas that are extremely cold. Like any other accessory that operates on the heat in any home, tankless water heaters have their own advantages and disadvantages. The most important thing is to take good care of your device. You should not buy your hot water shower at the price of a deadly case of electrocution or that of a raging fire. The heat that this equipment produces is a danger to the whole household if not taken good care of. The electric components of tankless water heaters may also come with a dizzying array of challenges. It can be hard to spot some of these challenges unless the danger becomes imminent. With this in mind, some small things like small defects in the electronic wiring or nearby clothes bin will and can lead to a great tragedy if you don’t attend to them well. Therefore, safety is a must requirement when dealing with tankless water heaters. You can expect very minimal challenges as long as you take good care of your device. Let me take you through some of the possible hazards that you need to avoid when dealing with tankless water heaters. The first step when dealing with tankless water heater safety is the installation process. A small mistake in the installation process can spell out the whole difference between a time bomb that is waiting to explode and a safe home. 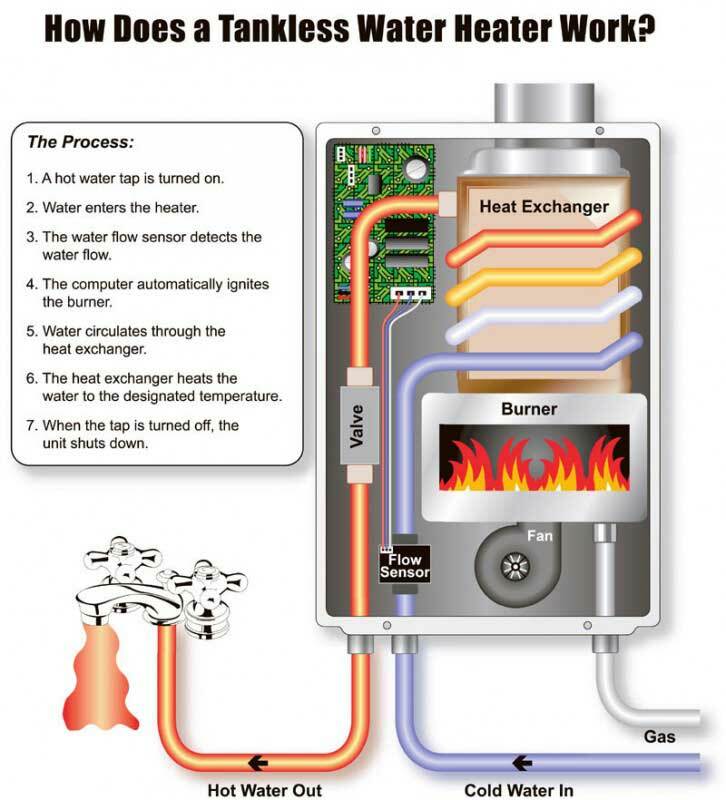 You may think that tankless water heaters installation is a simple DIY matter. The truth of the matter is that some people have the ability to handle this process on their own. There is a reason as to why manufacturers provide you with instructional manuals. Having some background in construction and electronics makes the whole process quite doable. However, it is recommended to employ a professional to undertake the installation process. There are some points on the tankless water heaters that need intimate knowledge in the industry. The heat that comes from tankless water heaters can result in a fire in the home if you don’t handle it properly. This, in turn, puts the wood, papers, cloths, and textiles into potential hazards if you don’t take good care of them. You have to make sure that you don’t keep these materials close to the heating element of the tankless water heater. Therefore, you must take these fire hazards into careful consideration while installing and using tankless water heaters in your home. Be keen to keep all materials that are flammable away from your heater. Also, you have to insulate all the construction components that you hide in the wood properly. This will prevent them from heat and will not ignite or weaken as you continue using the heater over time. The primary role od tankless water heaters are to heat the water in your home. This should be made in such a way that they are as water resistant as possible. The challenge is that the tankless water heater market has some products that have serious issues with quality. It may not have water resistance from the outside tanks that lead into the heater. There are various levels of water resistance. Some of them have the ability to withstand direct submersion while some models have water resistance qualities that can only tolerate humid and misty conditions. You have to carefully evaluate the moisture tolerance of the tankless water heaters you are installing in your home. You can also seek professional advice on the best ways of handling water resistance concerns with your water heaters. The main hazards that you may face while installing tankless water heaters include the content of moisture in the air and combustible materials. These hazards may appear to be very simple on paper but they can be difficult to detect and extremely dangerous unless you are sure of what you are doing. Put all these factors into consideration so as to safeguard your home from any possible dangers that come from water heating.